The future of RFID may be radically different than it is today. Behind the scenes the electronics industry is leaping into brave new worlds of printed electronics, electronic inks, and laser Nano and other innovations. Quite frankly we don’t think any of these innovations will mightily impact the current trajectory of RFID as we know it today. But in our life time there will be radical changes. 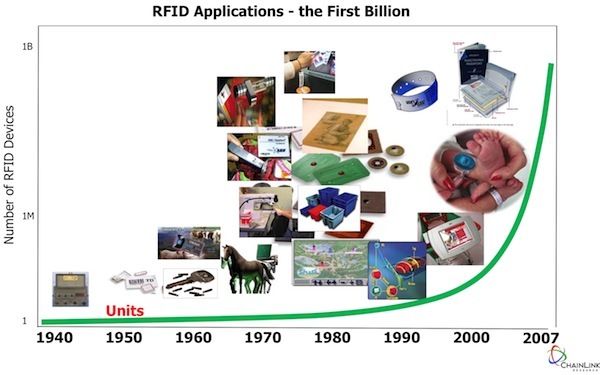 It took a long time for RFID to get to today—the first billion tags. But the market is humming along now. And even now a stunning amount of innovations is going on to find the true ‘home’ of RFID. 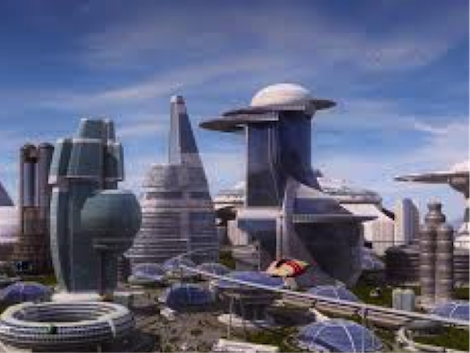 Figure 1 has the first billion and figure 2 has market trajectory into the future. But our goal here for this article is not to look back, but to leap forward into the future. The future of electronics, RFID and antennas is quite interesting.1 Material innovations in organic polymers, Nano technology, meta materials; and innovations in processing such as advances in photolithography, electron-beam lithography, direct laser/optical lithography, electrophoretic; new battery/power technologies—the whole area of printed electronics on organic new material, cloth and paper, all are in motion to step by step transform the semiconductor world. More flexible and cheaper production will enable a new generation of RFID growth. These will have a huge impact on the market in the future. 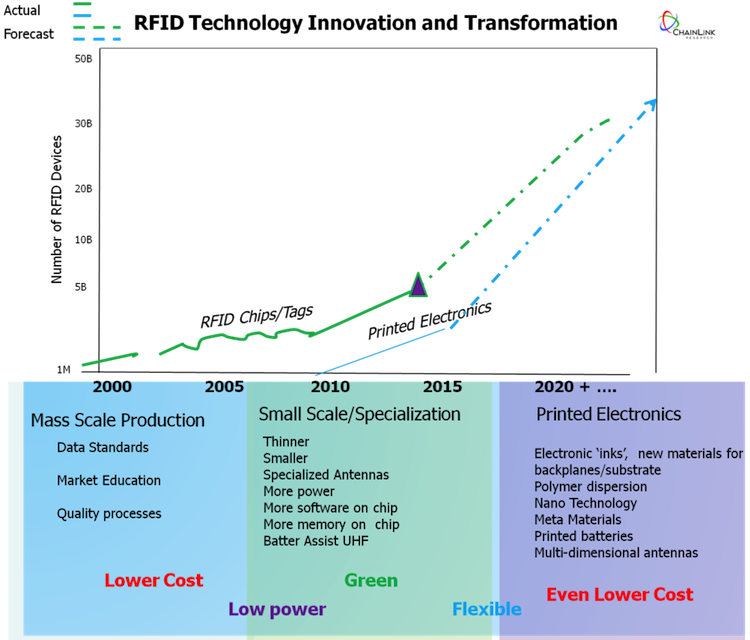 Though in Figure 2 we take a swag at the growth trajectory, we have to say that forecasters who focus on that may be a better source.2 Let’s look at the future of RFID innovation. Chipless touting has been done for some years now. Chipless does represent a big threat somewhere in the future since the versatility of printing is ubiquitous, (if cheap enough and smart enough printers can be developed) just as bar-coding can be done at the customer’s site. So the initial chipless threat could be to bar coding. This was what the RFID market had talked about, but the cost is too high and the versatility limited (barcodes can even be printed on cans, paper goods and virtually anything). Studies and pilots have shown that this printed RFID can store data and perform. Though limited today, thin film transistor circuits current work continues to develop in order to make these practical and ‘reachable’ by the commercial market in the coming years. The key will be creating the equipment that can be deployed as widely as barcode printers. Though we are a long way off from that, many companies today use managed services to create their barcode or RFID labels. These end-user firms could actually turn to the converters they already work with to produce this next generation of product. But the price a converter can afford to pay is limited—not millions per printer. Let’s face it. 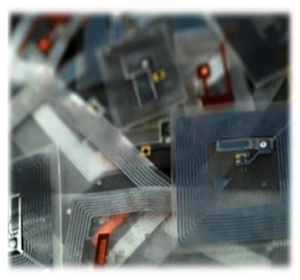 RFID has challenges in being read—environments vary greatly. Applications vary greatly. And customers need readability assurance. As the RFID use cases and case studies grow, so does the demand to add new categories—categories with big potential. The solutions provider who can make the health and beauty market shine will reap big rewards, for example. Diversity is a challenge, though. Just as in other hardware markets, computer aided design has come to the RFID antennas market. NXP, for example, has introduced software product RFID - PCB Antenna Designer for UHF tags. Custom designers such as Kanemastu,6 Vizinex (RCD), as well as major tag producers, understand that versatility is important to penetrate other market segments. Chip providers like Alien and Impinj have development platforms for their partners. And printer giants like Zebra publish standards and guidelines for antennas and inlay providers to design tags so that these products are compatible with theirs. One challenge with antennas is quality. Just as in other ultra thin electronic areas, manufacturing with extremely high quality takes a considerable investment in equipment and know-how. So, though the antenna is a critical component of the tag, there are actually only a few major producers in the world. And from a quality perspective there is a difference in performance and reliability across the manufacturers. Intelligent things and IoT applications often require the smarts to travel along with the asset. Firms like Tego are making big headway here with what they call smart assets. Surely this does increase the value of the asset. As supply chains, for example, crave more visibility, they need the smarts for high risk/ high impact shipments. High value assets as well as high cost processes such as maintenance gain value from ongoing—off the grid—intelligence with high memory tags. Of course the challenge—as always with RFID—is to focus on the high value use cases with a clear customer/market buying into the use case. Sensors are old story. Our world abounds with them. But taking the next leap into the RFID + Sensor world has taken some time. But our forecast is showing significant growth in this area. Again IoT may be part of the catalyst, but day to day applications from construction, to perishables/cold chain (food and beverage, pharma, health and beauty), environmentally controlled processes, from industrial, to home application can clearly benefit. market. BAP (Battery Assisted Passive) tags differ from Active RFID in that they do not emit a beacon. Though they have a power source of their own, they wait, like passive to be interrogated. Why have BAP, then? BAP allows more other types of applications to be part of the RFID system. The combination of UHF + power extends the read range of the UHF significantly, but allows it to be read by the same reader as other (non-battery) passive tags. This assists with multi-layer applications where cartons, for example, that may only need passive and within a container, that may require longer read range, be re-usable and need to store more data. These all can be part of one system vs. having multiple frequencies/protocols and the hardware that would need to accompany this. This is and will remain a fairly small market due the smaller target market due to the cost/form factor of these tags. However, the effort to provide thinner batteries and tags, as well as reduce cost can assist this sector a great deal to achieve its potential growth. Thin is in! Thinness, compactness is a goal for RFID; in many of the designed applications there is a lot of research and efforts to achieve thin and more flexible tags. Another is thin film11 —one method is creating circuits with low-temperature thin film technology. Inlays future is also going to be thinner—and cheaper. Nano technology is being applied both in the inks,14 as well as in tag and antenna materials. In the future a new generation of Nano-meta material—is being created. This allows for even smaller scale and ultimately cheaper technology. These are created with laser/optical lithography.